Hands up all those who remember Wood Street at Carlin How and for those who don’t, well it stood where the car park for the Working Men’s Club is now. 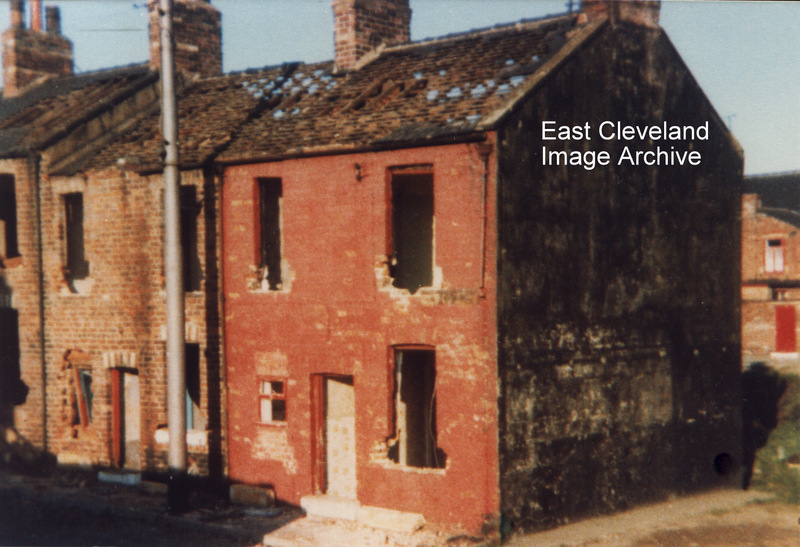 This photograph shows the demolition of Mr Walter Womack’s and Mr Walter ‘Wally – Taxi’ Goldby’s houses. Alan Pearson tells us: ”I was born at 16 Wood Street and was always led to believe that it was the oldest street in Carlin How. From looking at census records; Wood Street, Dixon Street, Steavenson Street, Wesley Terrace, Railway Terrace and Bells Huts all appeared between 1871 and 1881. Nos 1-26 LIC (Lofthouse Iron Company) in 1881 became Long Row in 1891 and Wood Street in 1901. ‘Woodhouses’ in the 1881 Census became Wood Cottages, then Bells Huts in 1891 Census. 1-5 Carlin How Road became 1-5 Reading Room, then Wesley Terrace. However, in 1871 there were 2 houses listed as Carlin How Lodge (where were these?) and 36 un-named, unnumbered cottages. It seems likely that these were part of 1-56 Carlin How in 188; which became in 1901 Maynard Street, Front Street and The Square – so was one of these the oldest street in Carlin How?”. Derick Pearson also tells us: “I took this photograph, our family owned two houses in Wood Street at that time; number 21 and the one my sister lived at no 7. I lived there with my children up till around 1975. This photograph was taken some time after that; Taffy Williams from Lingdale was one of the demolition merchants and this was the start of the demolition”. Image courtesy of Derick Pearson; from a collection compiled by Derick Pearson (also information regarding the two houses shown), thanks to Alan Pearson, Derek Dobson and Derick Pearson for the updates. I worked at Skinningrove steel works, I moved out of the cottages (rent £4 week) on the bank top, moved 100 yards to a two up two down outside toilet and shed; wick with rats, but only cost seven and six a week. Two houses occupied as others rapidly emptied and became derelict, ransacked and stripped. I have a copy of my grandmothers(Sarh Ann Garbutt) birth certificate November 1884, at 14 Bells Hutts, Carlinhow,Kilton Brotton U.S.D.? I took this photograph myself, our family owned two houses in Wood Street at that time; no 21 and one my sister lived in at no 7. I lived there with my children up till around 1975. This photograph was taken some time after that, Taffy Williams from Lingdale was one of the demolition merchants and this was the start of the demolition. We left Wood St. In 1964 when I was six years old, we lived at no 15, other occupants in Wood St at that time included Cooke, Rowe, Hullah, Blades, Breckon, Dredge, Cockburn, Harrison, Thompson and Couse. Only found this website recently. Quite a treasure trove of memories. I was born at 22 Wood Street in 1946. We moved to Loftus in 1948. I have not been back to this area for a long time. The photographs on this site are so interesting! My great-grandparents, Robert and Lucy Glover, lived there. He died in 1942 so perhaps your parents bought it from my family. I’d be interested to hear from you, especially if you have old pictures! I lived at no.17 as a child, and moved to Wesley Terrace about 1954.until I married in 1956. My name was Ann Seymour.